During his talk two suspended screens were used to give the audience a first-hand view of a massive solar flare and to showcase video from the International Space Station, illuminating the northern lights. 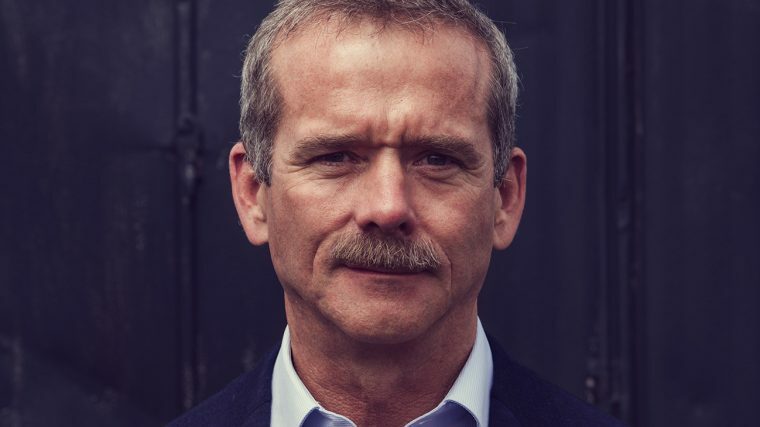 Hadfield believes the next logical step in space exploration would involve a lunar base. We as a species have already left the planet and are living comfortably on-board the International Space Station. Much like early Thinking Humans (a.k.a. : Homo sapiens), who continually pushed the literal boundaries to forge a better life for their progeny, we are a legion of visionaries working toward propagation of our species. We hardly get it right on the first attempt, but through perseverance and determination, we eventually succeed. Without perseverance and ingenuity, we as a species may have met a premature end. This was illustrated through the tale of Bartholomew, who was the first to sail around the Southern tip of Africa in 1487 and opened up a lucrative gateway to the land of foreign spices. Many explorers, including Cabot and Columbus, tried to make subsequent trips to Asia more efficient and ended up discovering the Americas as a result. Colonel Hadfield explained that in meeting David Bowie, he was everything you wanted him to be, and closed out the night with his retooled and beloved version of the David Bowie classic “Space Oddity”.